This wooden mail organizer has eight adjustable slots with metal name plates. 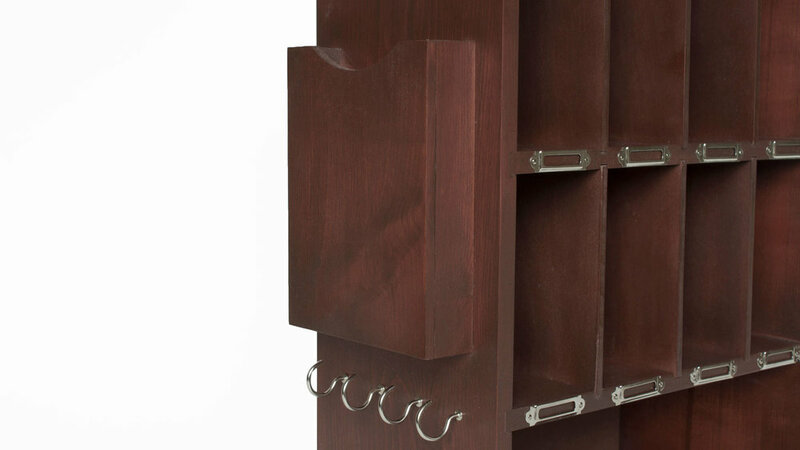 Beneath the slots is a magazine/catalogue rack for storage of larger items. On each side of the product are hooks to hang keys and easy to reach compartments for pens/pencils, envelopes, stamps, etc. The mail organizer can be mounted on a wall or left free standing for easy access. 100% Solid Pine. Available in Natural, White, Walnut, or Mahogany. Special orders available upon request.